People around the world will be able watch Dublin’s St. Patrick’s Day Parade live online this year. RTÉ, Ireland’s national broadcaster will be live-streaming the parade through their free international on demand player. The broadcast of the the Dublin parade will begin at 12:30 GMT and is presented by Aidan Power, Des Cahill and Blathnaid Ní Chofaigh. 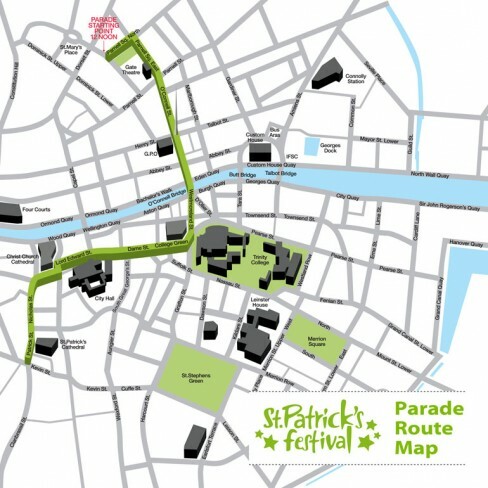 The Dublin parade will begin in Parnell Square and move through O’Connell Street before finishing at St. Patrick’s Church. You can follow the latest updates on the St. Patrick’s Festival twitter stream. Meanwhile, Google has decided to celebrate St. Patrick’s Day with a Doodle representing the ancient Celtic story of The Children of Lir. The story tells of the children of an Irish King who’s children were turned into swans by their evil step-mother and aunt, who became jealous of the King’s love for his children. Although a very old Irish legend later versions tell that, after 900 years, St. Patrick changed the children back into human form. For other things to do on St. Patrick’s Day you can download the special Paddy’s day edition of Angry Birds or the official St. Patrick’s Day iPhone and Android Apps.